It’s already October again. Didn’t we just have October about 6 months ago? This year has flown by so fast! That means that it’s already Breast Cancer Awareness month again. And once again, I’m sponsoring the Prairie Moon Quilts Pink Boot Event in honor of that. All through the month, I’ll be listing all kinds of my cowgirl and cowboy boot Christmas stockings in my Etsy shop. All different kinds of them. As fast as I can make them and get them listed. At the end of the month, I’ll donate a portion of the proceeds from the sale of every pink boot stocking to The National Breast Cancer Foundation. It’s my hope to raise enough to pay for at least one mammogram (hopefully more than one). I’ve created a special category to make it easy to find all the pink boots in one place. Click here: Pink Boot Event. We normally make a quarterly charitable donation from the sale of certain items in my shop anyway. The Pink Boot Event is in addition to that. As usual, a portion of the proceeds from any of the other stockings or stocking patterns will also be donated. So you don’t have to buy just a pink one to be helping out a good cause. 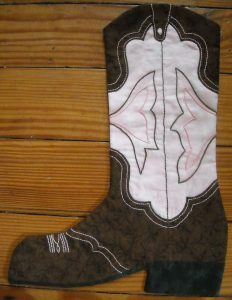 So, if you or someone you know needs a cowboy boot Christmas stocking this year, hop on over and pick one up. You’ll be helping out a great cause and getting a cute Christmas stocking at the same time! If you don’t see one you like today, check back tomorrow or the next day or next week . . . They’ll all be different, and you may eventually find the one that’s right for you . . .
And if you don’t, you can always request a custom one for yourself! I’m still taking custom orders for this Christmas up until December 1. Any stocking can be personalized or have crystals added for a small additional fee.